I like stats, and I like elections, so I figured I'd write a bit on some of the statistics coming out of the Edmonton election so far (yes, I know we haven't even had official candidates for two whole days yet but bear with me, this will be fun!). Under Edmonton election bylaws, candidates are required to make their donor lists publicly available following the results of an election. This year, these stats won't be posted until March 1, 2014, but of course candidates are free to do so whenever they wish. For this graph, as you move along to the right with increasing donation values added in, you can see the total sum of all contributions go up, all the way to the maximum allowable donation of $5,000. What you end up getting is a fairly smooth profile until around the $3,000-$4,000 range, where all of a sudden people figure if they're in for a penny they may as well be in for five thousand dollars, and you get a MASSIVE spike at the $5,000 donation end. 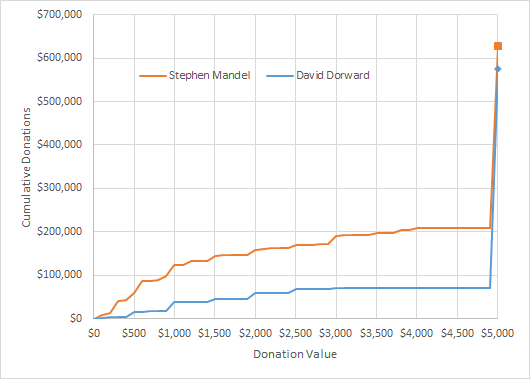 Up until the maximum donations, Mandel had almost three times as much money as Dorward, but Dorward ended up bringing in the big guns and amassed $85,000 extra in the $5,000 denominations, bringing their final totals much closer together (but of course, in the end Mandel still beat him by quite a large vote margin...). *Expected donations in the $4,000-$5,000 category are taken to be $5,000, based on the profile shown before. Unfortunately, donations that are less than $100 aren't broken down by donor, but Mandel and Dorward received $8,548 and $2,020, respectively. This method of breaking down the donations into categories appears to be very accurate at predicting the total amount candidates received in donations, which is handy because of what you're about to read next! Two of this year's candidates for Mayor, Don Iveson and Karen Leibovici, have within the last week released some information on their donors. Good for them - they certainly didn't have to do it yet, but it's a nice sign that candidates who pledge to be accountable have already gotten the Ball o' Transparency rolling. Their lists aren't quite as broken down as Mandel's or Dorward's from last election, and instead we are given a list of donors and broad categories that they fit into donation-wise. Again, donations of less than $100 aren't listed. $100-$500 $300 120 36,000 ?? $500-$2,000 $1,250 40 50,000 ?? $2,000-$3,500 $2,750 19 52,250 ?? $3,500-$5,000 $5,000* 33 165,000 ?? It looks like the break-into-categories model for Don Iveson's campaign is surprisingly very accurate. The final sum for the <$100 category was the only one that was given, but even the amount for that category was pretty much in line with what you'd expect. $25-$100 $62.5 ?? ?? ?? $100-$1,000 $550 94 51,700 ?? $1,000-$3,000 $2,000 23 46,000 ?? $3,000-$5,000 $5,000* 44 220,000 ?? The results seem mostly fine, I suppose - at first there's not a lot to really compare it to. What's interesting is that $47,300 figure at the end. I suppose it isn't actually missing, per se, and presumably it mostly belongs to the $25-$100 category (Leibovici's website indicated that $25 was the lowest donation they'd received). Karen Leibovici has found a lot of small-time donors (who apparently haven't donated in this manner to mayoral candidates before). Perhaps this is the first sign of a truly novel strategy? The donation profile for the Leibovici campaign is absolutely wonky, and consists mostly of $1,000, $3,000, and $5,000 donations. This seems tremendously unlikely. More likely the quoted figure of $365,000 is either not from the same date as the list, or the list as published is incomplete. The seems plausible since the list was published on September 19th but was titled "September 16th", so perhaps a ~$40,000 or so isn't reported on the list, with $365,000 being all donations as of the 19th. 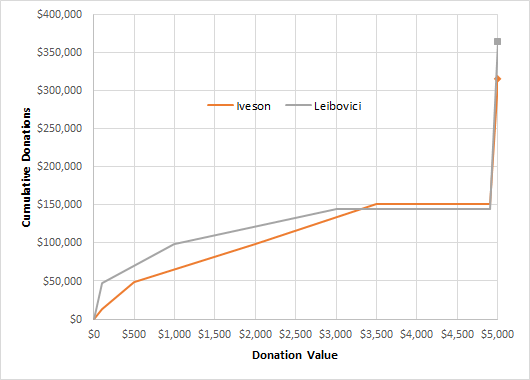 Again, this graph has less data to work with, so it's far less complete than the results from 2010, but still appears to show that Leibovici gets much more support from large donors (at the $5,000 maximum) than Iveson so far. But with the election only having officially begun this week, none of this really matters, I suppose! Stay tuned for the next post, where I talk about polling. Yay!